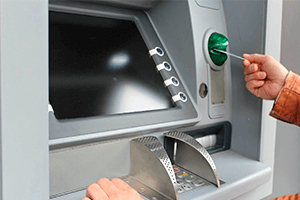 ATM environment monitoring is very critical for better life and protection for the components inside ATMs. We provide a complete plug-and-play system for ATM monitoring. It works with SIM card without internet connection. Hence, even if an intruder disconnects the internet, it will still work. It detects excessive vibration, which might be an attempt of burglary. It can generate phone call and SMS alerts in case of high temperature, high humidity, low UPS power, power failure, excessive vibration, etc. It can activate a separate CCTV camera in case of an attempted burglary. It can work as a complete independent system and data will be stored on a cloud based server. It has a battery backup and can work even in case of power failure. Temperature and humidity inside the ATM kiosk or rooms are very important for proper functioning. High temperatures can lead to data loss. High humidity inside the ATM kiosk can lead to corrosion of components (Read more about Corrosion Monitoring), even short circuits. The system makes phone call and SMS alerts for unto 5 operators in case the temperature or humidity goes beyond permitted levels. The customer can program the triggering limits for generating the alerts. Our system is a complete solution which can generate phone call alert if there is a power failure. It will generate an alert when there is a power failure. Also it will generate another alert when the pore is restored. Based on your choices, we can deactivate any of these alert systems. One of the most cases of ATM burglary is by damaging the ATM. During such an attempt, there will be excessive vibrations on the machine. By monitoring the vibration, the customer can ensure safety of the ATM. Upon detecting the excessive vibration, it is also possible to activate a camera with live streaming. Different statuses like UPS health, UPS power, voltages and currents can be monitored remotely. Check our Monitoring systems for more information. If the customers desires, he can also connect a local alarm or siren to the monitoring system. We can also configure the same in such a way that it will be activated only if there is a burglary attempt. You may not need a local siren in case of a temperature alert. We can provide multiple output signals for different types of external alarms. In case you require monitoring of water leak inside the ATM or the room, you can connect a water leak sensor cable. The sensor cable comes in 5 meter, 10 meter and 20 meter sizes. Depending on the size of the room, you can decide the suitable size. The system will detect even if there is a very minor water leak. Our system is GPRS based device and hence, can be easily installed without any pre-configuration. You have to simply insert a SIM card into the system and it starts functioning. All programming can be done online through our software platform. 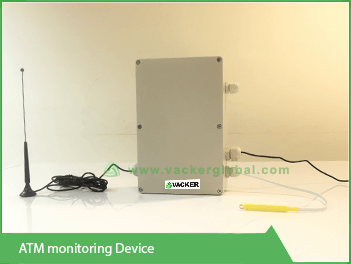 There are a set of sensors for different functions such as vibration sensor, temperature sensor, humidity sensor, door monitoring sensor, water leak sensor, etc. All sensors are connected to a controller for processing. We program this controller for various triggering limits. Various relays for output signals to activate local alerts. A GPRS transmitter which transmits the data and make phone calls and SMS. The customer has to insert a SIM card into this GPRS device and it starts functioning. Note: Few of the above parameters are optional. Please contact us for complete details.